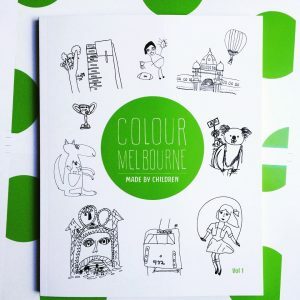 Colour Melbourne is the world’s first colouring book made by children! Just PUBLISHED! Colour Melbourne is a colouring book made entirely by children. 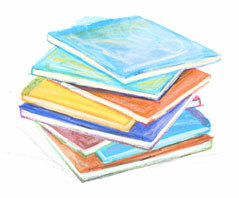 55 artists aged between three and 10 years old have made this creative and very original book. Colour Melbourne is the world’s first colouring book made entirely by children. Julie Kennedy, of Pip Dot Art Studio, and Joanne O’Callaghan have been working with children for a year to bring the concept of a book made by children together. The book has been published following a successful crowdfunding campaign. “We have been working on this project for a year and are yet to find a colouring book created with the hands and imagination of children in Australia or worldwide. Colour Melbourne is the first we know of in the world as a commercial colouring book made by children” said, children’s book author Joanne O’Callaghan. There is no one way to draw something and drawings don’t need to look a certain way. There are no computer drawn images in this colouring book. Children and adults can bring the city alive with colourful hot air balloons, stripy football jumpers, polka dot fashion, delicious ice-creams, and buildings of all shapes and sizes. Hand-drawn pictures highlight much loved Melbourne landmarks such as Flinders Street Station, Federation Square, the Royal Exhibition Building, Melbourne Cricket Ground, and the National Gallery of Victoria. There are also parks, picnics, and penguins. And of course a tram or two! 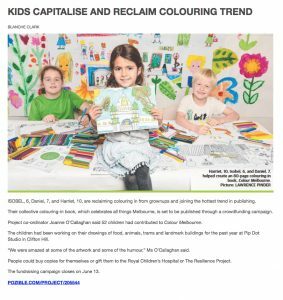 With the support of their project backers the have been able to donate copies of Colour Melbourne to children in hospital through The Royal Children’s Hospital Foundation. Project supporters also donated books to school programs run by The Resilience Project, an organisation helping young Australian’s be mentally healthy. Colour Melbourne is now available in Melbourne at all good bookstores including The Avenue Bookstores, Readings, Hill of Content Bookstore, and Heide Museum of Modern Art.